OCEANSIDE — Thursday evening motorists and cyclists were the first to drive on a re-striped Coast Highway 101 between Morse Street and Oceanside Boulevard. During the day the highway was narrowed to one traffic lane in each direction, and bike paths were expanded to 8 feet, with added 8 feet safety buffers between vehicles and bikes. 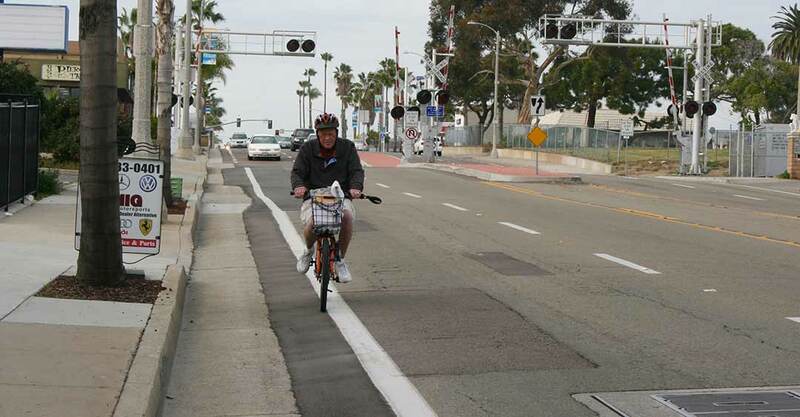 The highway pilot program will be studied to provide real time feedback on planned lane reduction and added bike paths to all of Coast Highway in Oceanside. Traffic lights will be adjusted over the next few weeks to mimic the traffic flow of planned roundabouts. Road signs will alert drivers of the road narrowing to one lane in each direction. A crosswalk with rapid flashing beacons is planned be added to the stretch of road. DiPierro said the City Council is scheduled to approve $60,000 for crosswalk, ramps, medium island and pop out curbs construction in April. The city website says construction of the crosswalk may begin in four weeks. The crosswalk will provide safe access to the Loma Alta Creek footpath to the ocean. Traffic flow on the restriped highway will be monitored 24/7 through a BlueTOAD system. Visual vehicle, bike and pedestrian counts will also be taken. Gathered information will be compared to prior traffic flow and travel patterns. Data will be shared with council in September to determine whether to allow road improvements to stay in place for another year. Current vehicle counts are 16,200 cars a day in fall, and 19,100 a day in summer. Fall counts also logged 247 bicyclists and 332 pedestrians a day. Forty pedestrians a day crossed the highway at the location of the planned crosswalk. The city is looking to move forward with complete streets improvements to all of Coast Highway in order to slow traffic and improve bike and pedestrian safety. Changes will mirror pilot program improvements. Nine roundabouts, wider sidewalks and streetscaping are also part of the plan. DiPierro said city staff will present planned Coast Highway complete streets improvements and collect feedback at a workshop April 13.